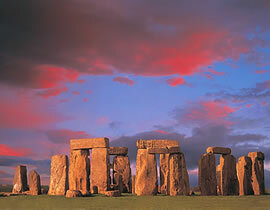 There is nothing quite like Stonehenge anywhere in the world and for 5000 years it has drawn visitors to it. We shall never know what drew people here over the centuries or why hundreds of people struggled over thousands of years to build this monument, but visitors from all over the world come to marvel at this amazing feat of engineering. Before Stonehenge was built thousands of years ago, the whole of Salisbury Plain was a forest of towering pines and hazel woodland. Over centuries the landscape changed to open chalk downland. 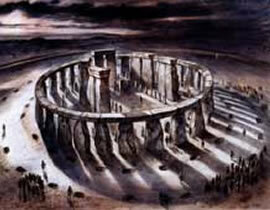 Stonehenge was built in three phases. The first stage was a circle of timbers surrounded by a ditch and bank. The ditch would have been dug by hand using animal bones, deer antlers which were used as pick-axes to loosen the underlying chalk and then the shoulder blades of oxen or cattle were used as shovels to clear away the stones. Excavations of the ditch have recovered antlers that were left behind deliberately and it was by testing their age through radio carbon dating we now know that the first henge was built over 50 centuries ago, that is about 3,100 BC. That's where the mystery begins. We haven't just found old bones, around the edge of the bank we also found 56 holes now known as Aubrey Holes, named after the 17th century antiquarian, John Aubrey, who found them in about 1666. We know that these holes were dug to hold wooden posts, just as holes were dug later to hold the stone pillars that you see today. So this was the first stage built about 5,050 years ago, wooden post circle surrounded by a deep ditch and bank. Then about 4,500 years ago � 2,500 BC and about 2,400 years before the Romans set foot in Britain, it was rebuilt. This time in stone, bluestones were used which are the smaller stones that you can see in the pictures. These came from the Prescelli Mountains in Pembroke, South Wales 245 miles (380kms), dragged down to the sea, floated on huge rafts, brought up the River Avon, finally overland to where they are today. It was an amazing feat when you consider that each stone weighs about five tons. It required unbelievable dedication from ancient man to bring these stones all the way from South Wales. 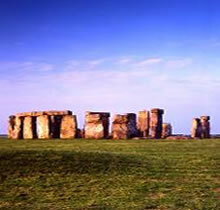 Before the second phase of Stonehenge was complete work stopped and there was a period of abandonment. 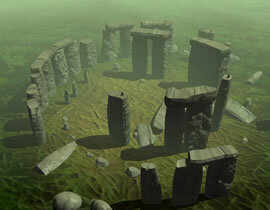 Then began a new bigger, even better Stonehenge, the one that we know today- this was approximately 4,300 years ago, about 2,300 BC, the third and final stage of what we see now.